In stark--some would say "diametrical"--contrast to last week's theme, I've constructed the following RADIOLA! playlist for WHCL tonight 8 PM ET, just in time for Halloween. It'll be a lot more fun than it at first may appear, and I just might call in someone with some expertise on this topic to assist with the broadcast. WE'RE ON THE AIR IN BRITISH COLUMBIA!! Stop by for coffee and jazz--no tricks, only treats. Another one of those "metaphysical" themes that RADIOLA! habitues know so well. I explore the more positive aspects of the afterlife, with a few non-thematic selections to keep it interesting. It's now up on Live365. Enjoy! 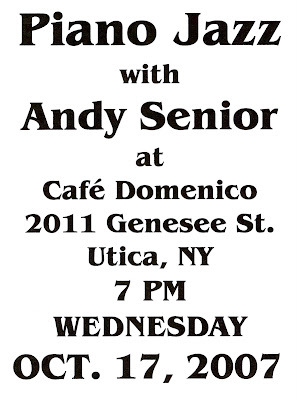 Last week's piano gig at the Cafe Domenico went very well--and so I'm scheduled to play next Wednesday, October 17. Thanks to everyone who came out to hear me. Next Wednesday should be great, too. 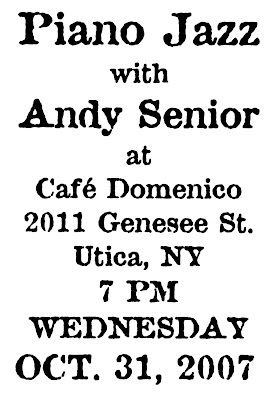 Cafe Domenico is at 2011 Genesee Street, Utica, NY. Stop in for coffee and desert--and jazz! "Lullaby of the Leaves" from Oct. 3 is now posted on my myspace page. Tonight on RADIOLA! I approach the whole "Columbus" thing in a subtle (some would say "cryptic") and balanced manner, with appropriate vintage music selections. Come discover what it's all about on WHCL tonight (Friday) at 8 PM Eastern time. Relax, it'll be fun. Just bring your Dramamine. Anachronalgia meets Nostalgia tonight on RADIOLA!